A husband attacked his pregnant wife while she was also holding their 13-month-old baby. 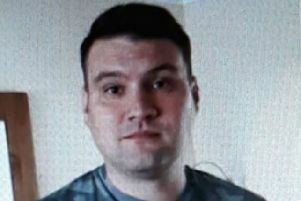 Chesterfield magistrates’ court heard on Wednesday, August 3, how Bradley Haines, 26, formerly of Broughton Close, Riddings, Alfreton, grabbed his wife’s hair to try and stop her from cutting his clothes and then grabbed her by the hair again as she was holding their baby son. Prosecuting solicitor Rod Chapman said: “The defendant had been out and as far as his wife was concerned he had been at Derby Beer Festival with work colleagues. But when he arrived home at 2am he said he had been attacked by taxi drivers at Burton-upon-Trent and she thought that was strange. During the argument his wife leaned over him and pushed him down, according to Mr Chapman, and she told him to leave and threatened to cut his clothes with scissors if he did not go. Mr Chapman added: “Haines jumped out of bed and took his wife by the hair and dragged her around the room and put her to the floor. Haines admitted to police that he had grabbed his wife’s hair because he could not afford to replace his clothes and had pulled his wife to the floor and let go as she released the scissors. He also admitted grabbing his wife by her again and pulling her to the floor and she had been holding the baby and was pregnant at the time. Haines, now of Butterfield Lane, Brackenfield, Alfreton, pleaded guilty to the assault after the incident on July 9. Mr Chapman added that his wife has given an indication that she no longer supports the prosecution. Defence solicitor John Wilford said: “My client will say his behaviour - up until the point when he was on the landing - was that he was defending himself and he had pulled his wife’s hair because she had a pair of scissors. Magistrates adjourned the case to consider a probation report before sentencing Haines on August 24. Haines was released on conditional bail on the grounds he does not contact his wife.